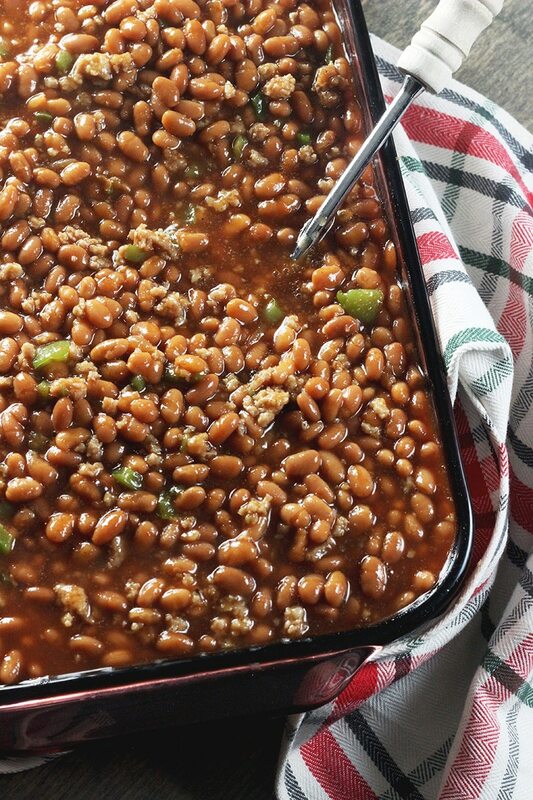 A slightly sweet, tasty pork free baked beans recipe that is still full of delicious BBQ appropriate flavor and perfect for the dish to take to your next potluck BBQ. Do you ever get invited to a BBQ and want to take something but don't know what? Don't have a lot of time? Or just don't wanna be in the kitchen slaving over a hot stove? When I was kid people didn’t say baked beans, they said pork and beans. Because there was always inevitably some form of pork in the beans. Whether it was hot dog pieces, bacon or whatever. But what happens if you don’t eat pork? 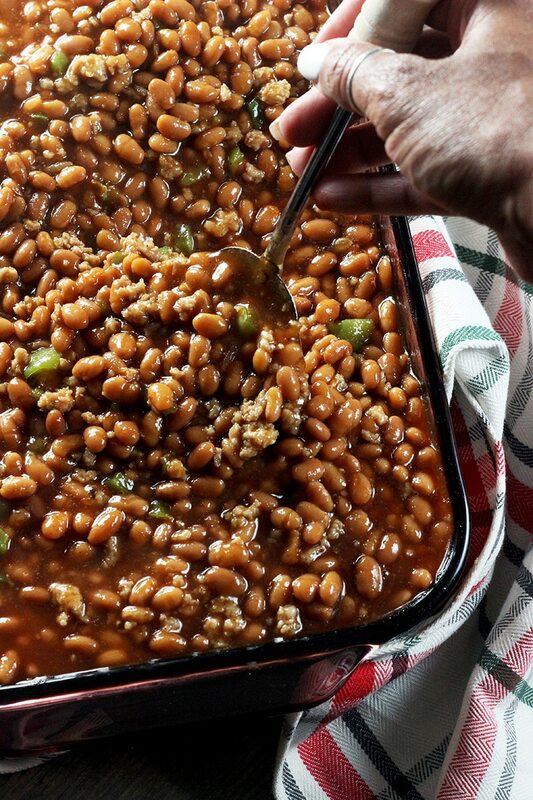 Do you have to give up the tasty BBQ dish that is baked beans? This recipe is pork free cause y'all know I stay making beef and pork modifications. And the best part, is I make them taste darn good! Did you know that unless you get the vegetarian version of baked beans, many brands still contain some form of pork or pork by-product? So for this recipe, you have to get the vegetarian version and we’ll add our own meat. You ready to find out how? Let’s go! 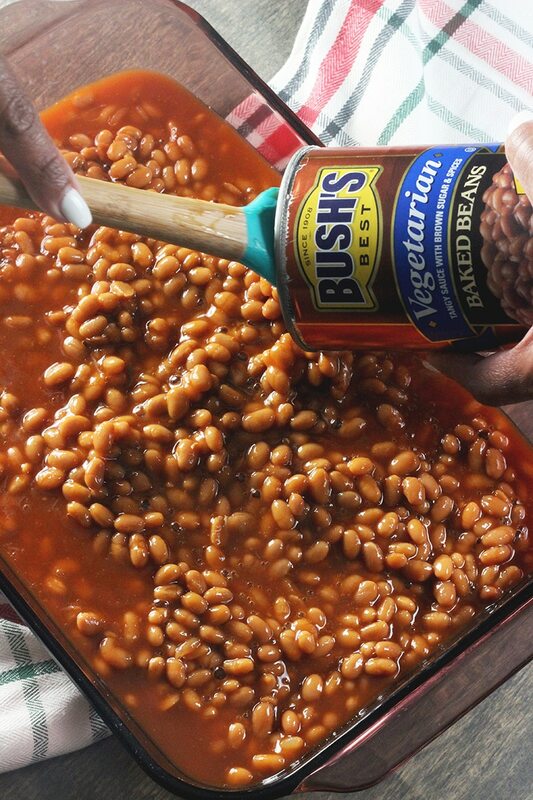 All you need is 4 cans of the vegetarian baked beans (I typically use Bushes brand). Some brown sugar, green peppers and a bit of seasoning. These are one of the simplest BBQ sides you will prepare. Here is the recipe and instructions for you. 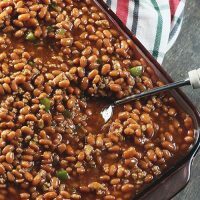 A slightly sweet, tasty baked beans recipe free of pork but still full of delicious BBQ appropriate flavor. Open baked bean cans and and drain the juice from 2 of the cans to keep the cooked beans from being runny. Pour into dish. Set aside. On stovetop add ground meat to skillet warmed up over medium heat. Season meant as desired. I use seasoning salt, garlic salt, and pepper). 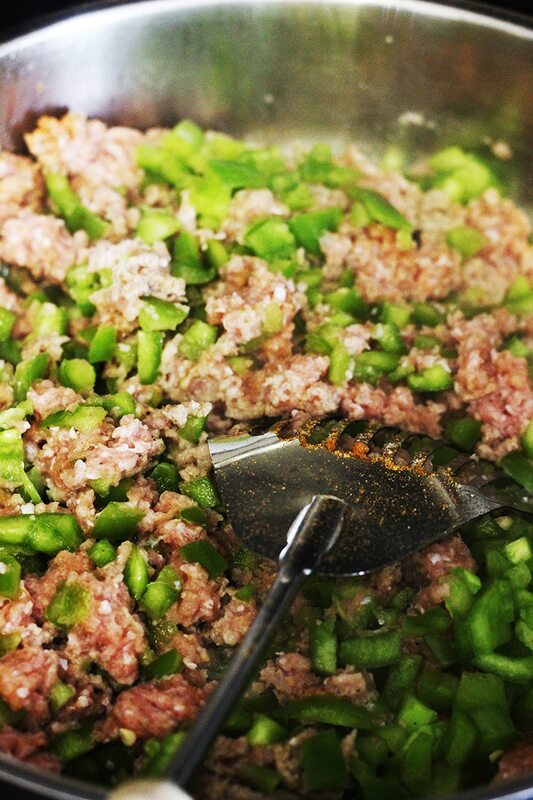 Once ground meat is halfway cooked through (which you can tell when its half pink and half browned) add in green peppers and cook through until all meat is browned and no pink remains. 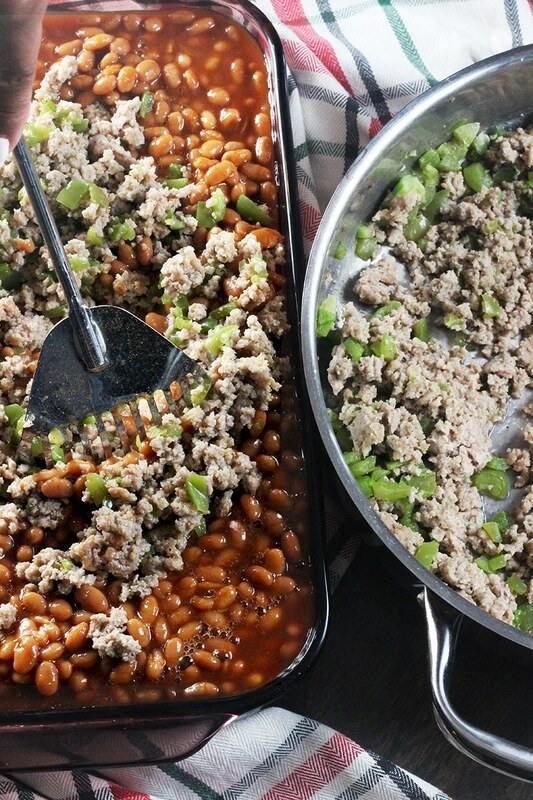 Add good meat and peppers to dish with baked beans. Add in seasonings and stir until all ingredients are mixed through. Bake for 45 minutes uncovered, or until baked beans are nice and bubbly. 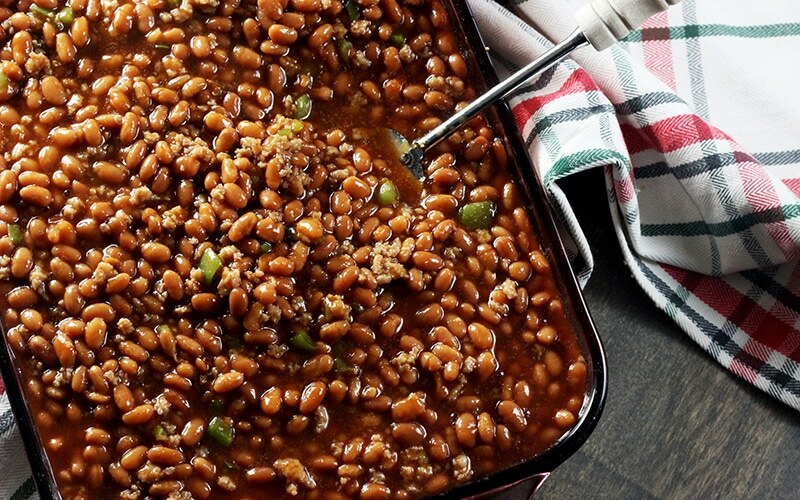 Interested in saving Pork Free Baked Beans recipe for later? Pin it using the button below. A friend asks what they should bring to the next potluck BBQ? Send this to them!